Retailers have been selling issues of Rick Remender (BLACK SCIENCE, Uncanny Avengers) and Wes Craig’s breakout series DEADLY CLASS hand over fist, and as if that wasn’t enough to excite comic book stores, Image Comics is pleased to announce that a special second printing of DEADLY CLASS #3 will feature a variant cover and will be free to all retailers. A limited quantity will be available, retailers can match their orders for the first printing, any orders placed beyond that may be subject to allocations. Additionally, DEADLY CLASS #2 has sold out and is slated for a second printing to meet customer demand. It can be ordered with Diamond Code FEB148225. This hotly anticipated new series follows a group of teens in 1980s San Francisco who are training to be assassins in the most brutal high school on Earth. Here, the world’s top crime families send the next generation of killers to be trained. Murder is an art. Killing is a craft. At Kings Dominion High School for the Deadly Arts, the dagger in your back isn’t always metaphorical, nor is your fellow classmates' poison. DEADLY CLASS #3 has completely sold out at the distributor level, but may still be available in comic stores. It is currently available digitally on the Image Comics website (imagecomics.com) and the official Image Comics iOS app, as well as on Comixology on the web (comixology.com), iOS, Android, and Google Play. DEADLY CLASS #1 is still in stock and available to order with Diamond Code JAN148238 and issue #2 is slated for a second printing which will be available to order with Diamond Code FEB148225 and available on 4/23—just in time for those still discovering this thrilling new series. Image Comics is pleased to announce that the third issue will be going back to print to meet customer demand. 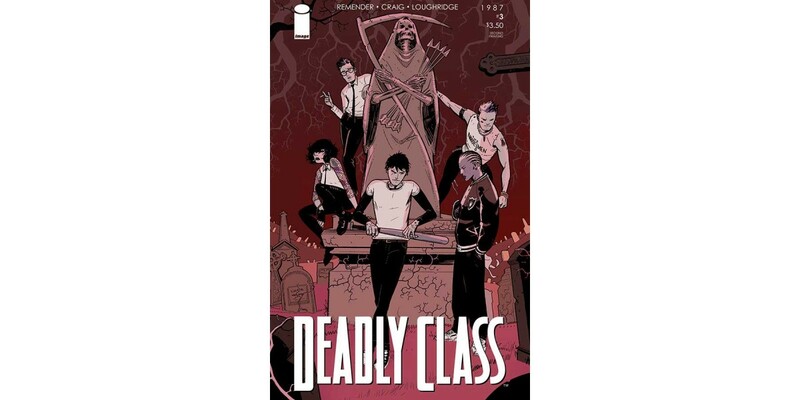 The second printing of DEADLY CLASS #3 (Diamond Code FEB148222) and it will be released on 4/23. DEADLY CLASS #4 will release on 4/30 and can be pre-ordered with Diamond Code FEB140597.